increase in CRS. The increase in rubella has occurred in unvaccinated adolescents and adults as well as in children and adults in religious communities with low levels of vaccination. 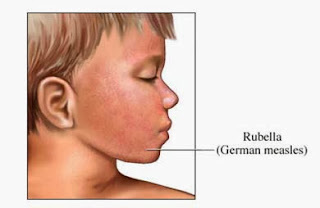 Rubella is only a moderately contagious illness compared to more infectious diseases such as measles. It is passed directly from person to person via coughing, sneezing, and talking. The disease is most contagious as the rash is appearing, but can be spread from 1 week before to 5-7 days after rash onset. Infants with congenital rubella syndrome, who were infected with rubella before birth, may be able to infect others for usually about a year, and can therefore transmit rubella to those susceptible persons caring for them. Rubella may be transmitted by infected persons who exhibit no signs or symptoms, and 30%-50% of all rubella infections are not recognized as rubella disease. The period from exposure to rubella to actual onset of rubella symptoms, called the incubation period, varies from 12-23 days, with an average of 16- 18 days. Children are apt to have a milder case of rubella than adults. For rubella illness developed after birth, symptoms are often mild with 30-50% of cases having no sign of symptoms. 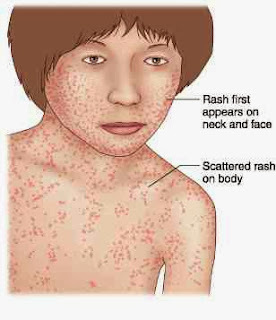 In children, rash is often the first manifestation. In older children and adults, there is often 1-5 days of low-grade fever, tiredness, and upper respiratory infection preceding the rash. There are a number of common symptoms. 1.A fever of 99-101 F, which lasts about 2 days, is common. 2.The rash usually begins on the face, progresses from head to foot, and lasts about 3 days. The rash, which is usually fainter than a measles rash and is often itchy, may not be easy to identify as a rubella rash. Rubella can be confused with many other rash illnesses. 3.The lymph nodes may begin swelling 1 week before the rash and remain swollen for several weeks. 4.Joint pain and temporary arthritis, which are uncommon in children, occur frequently in adults, especially in women. Complications of rubella infection occurring after birth are uncommon but tend to occur more often in adults than in children. Arthritis and joint pain may occur in up to 60% or more of adult women who contract rubella. Fingers, wrists, and knees tend to be affected. These effects may take up to months to resolve, but rarely lead to long-term problems. Swelling of the brain occurs rarely, and is more frequently found in adults (especially in females) than in children. Problems with blood clotting can occur more often in children than in adults. Effects may last weeks to months. The developing unborn child is at high risk to develop severe rubella with lasting consequences, if the illness is passed from the mother to the unborn baby early in the pregnancy. Developing unborn infants infected with rubella in utero have a number of problems and symptoms which are called congenital rubella syndrome or CRS. Some common manifestations of congenital rubella syndrome include: deafness; eye problems, including cataracts and glaucoma; congenital heart disease; mental retardation; and many others. After an attack of rubella, lifelong protection against the disease develops in most persons. However, reinfection with rubella virus can occur. The overwhelming majority of these reinfections occur without symptoms, but occasionally rash or joint pain have been observed. Rubella reinfection has also occurred in persons who received the rubella vaccine. Rubella reinfection during pregnancy can rarely result in transmission of the virus to the unborn child. Rare cases have been reported in which infants with congenital rubella syndrome were born to mothers who were reinfected during pregnancy. Rubella vaccines were first licensed for use in the U.S. in 1969. In January 1979, a new more potent vaccine was licensed and the other vaccines were discontinued. Use of rubella vaccine has had an impressive impact on disease: in 1969 over 55,000 cases of rubella and 29 rubella deaths were reported. In 1988, rubella dropped to an all time low of 225 reported cases. But between 1988 and 1990 a moderate resurgence of rubella occurred. In 1990 over 1000 cases were reported. About 95% of those who receive rubella vaccine develop protective immunity. To date, vaccine protection appears life-long for most persons. The vaccine virus cannot be transmitted from person to person except through breastfeeding. Breast feeding mothers should be vaccinated against rubella, even though they may rarely pass vaccine virus to their infants. While the infant may develop a mild case of rubella, serious illness should not occur and the infant should respond well to vaccine at 15 months of age. Rubella vaccine may cause side effects that include fever, swollen lymph nodes, joint pain, and a rash. A rash occurs in about 10% of those receiving the vaccine. About 25% of adult women report joint pain after vaccination; men and children report such symptoms much less commonly. A true arthritis has been reported in only about 10% of susceptible female vaccinees. When joint symptoms do occur, they generally begin 7-21 days after immunization, persist for 1-3 days and rarely recur. Recurrences have been rarely reported for up to 8 years. The goal of rubella vaccination is to prevent congenital rubella infection, which can result in still births, miscarriages, and severe birth defects. This goal can be achieved only by protecting all women of child-bearing age, as well as other people who come in contact with them, such as family members, co-workers, and other contacts. Adequate vaccination consists of one dose of rubella vaccine; no booster dose is needed or recommended, although many person will receive 2 doses because of the 2 dose measle-mumps-rubella combined vaccine schedule. 1.All children 12 months of age or older, preferably using rubella vaccine in combination with measles and mumps vaccines(MMR vaccine). If the rubella vaccine is part of a combination that includes measles, such as MMR vaccine, the combination vaccine should generally be given to children 15 months of age or older. 2.All older children not previously immunized. 3.All susceptible adolescents and adults, particularly women of childbearing age who are not pregnant. A person is considered susceptible to rubella if they have no record of vaccination on or after 12 months of age or have no laboratory test result proving immunity. If vaccination or immune status is not known, the recommendation is to vaccinate without prior laboratory testing. Immune persons who are revaccinated are not at any increased risk of adverse events from the revaccination. Infants vaccinated with the MMR vaccine before their first birthday should be considered unvaccinated, and should be revaccinated with MMR vaccine at age 15 months or older. After puberty, a woman with no documented evidence of rubella immunity may be vaccinated if she says she is not pregnant and is counseled about the need to avoid pregnancy for 3 months following vaccination. Neither a pregnancy test nor a test for rubella immunity need to be performed first. 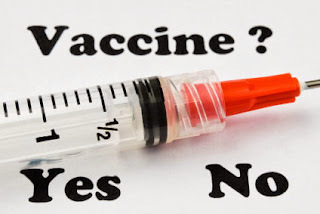 Particular emphasis should be placed on vaccinating both males and females in colleges, places of employment, health-care settings, prisons, or other areas in which unvaccinated adolescents or adults may congregate. Rubella vaccine is not known to cause special problems for pregnant women and their unborn babies, even though natural rubella disease does cause birth defects. However, doctors usually avoid giving any drugs or vaccines to pregnant women unless there is a specific need. Therefore, to be safe, pregnant women should not be vaccinated with rubella vaccine. If a pregnant women is vaccinated or if she becomes pregnant within 3 month of vaccination, she should see her physician for a thorough explanation of the risks and concerns for the unborn baby. Rubella vaccination during pregnancy is not a reason in itself to consider interruption of the pregnancy. However, the decision whether to continue a pregnancy is always a personal and medical decision which can only be made by the pregnant woman and her physician. Persons with defective immune systems should not be given rubella vaccine. This includes persons with certain cancers, leukemias, lymphomas, or persons undergoing therapy with certain cancer treatments, radiation, or large doses of steroids. A physician should be consulted before a patient who may have a defective immune system is given rubella vaccine. On the other hand, a person who has contact or lives in a household with an immunosuppressed person may be given rubella vaccine as usual. Susceptible children infected with the HIV virus, but who do not have disease caused by HIV, should receive rubella vaccine. Persons with symptomatic HIV infection, for whom MMR vaccine is indicated, may be considered for vaccination. Asymptomatic children do not need to be evaluated and tested for HIV infection before decisions concerning vaccination are made. All preparations of rubella vaccine contain trace amounts of neomycin. Persons who have experienced life threatening allergic reactions to neomycin should not be given the vaccine. Severe allergy means an intense life-threatening reaction requiring medical attention. A history of simple skin reaction to neomycin is not a reason to avoid receiving the vaccine unless that rash was part of a life threatening reaction such as hives. Live rubella vaccine does not contain penicillin, so a history of penicillin allergy is not a concern for vaccination. Rubella vaccine given by itself can be administered with safety to persons with egg allergies. However, if the vaccine is combined with measles and mumps vaccines, it should not be administered to persons with severe allergy to eggs. (Egg products are used to make measles and mumps vaccines.) Persons who have egg allergies that are not life threatening in nature can be vaccinated with MMR vaccine. If a person can eat eggs, then the allergy is not considered to be severe. Vaccination of persons with a high fever should be postponed until recovery. However, susceptible children with mild illnesses, such as an upper respiratory infections should be vaccinated, whether or not fever is present. Rubella vaccine should not be given within 14 days before the administration of immune globulin (IG), or for at least 6 weeks, and preferably for 3 months, after a person has been given IG, whole blood, or other antibody-containing blood products. However, women may receive rubella vaccination after delivery. Persons vaccinated after receiving whole blood or other blood products, such as Rho-Gham after delivery should be tested 6 to 8 weeks after vaccination to see if they are immune. Persons who receive the vaccine do not transmit rubella to others, except in the case of the vaccinated breastfeeding mother. In this situation, the infant may be infected through breast milk and may develop a mild rash illness, but serious effects have not been reported and the infant can be vaccinated later without problems. These infants should receive rubella vaccine at 15 months of age as usual. Breastfeeding mothers without documented evidence of immunity to rubella should receive rubella vaccine. While it is not recommended that pregnant women receive the rubella vaccine, some women have been inadvertently vaccinated while pregnant. When rubella vaccine was licensed, this situation was of concern. 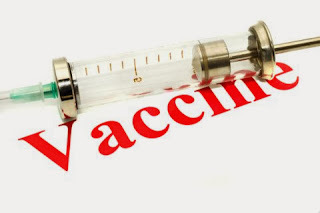 Based on data in the Vaccine in Pregnancy Registry (VIP), there is no evidence that defects consistent with congenital rubella syndrome have occurred in offspring of women vaccinated during or close to the time of pregnancy. Therefore, the observed risk of birth defects for vaccination in pregnancy is zero. However, since the vaccine consists of a weakened live virus, it is theoretically possible that the vaccine could rarely damage the unborn child, although such an effect has never been observed. It is believed that if vaccination occurs within 3 months before or after conception, there is a theoretical risk of CRS, but it is so small as to be negligible. Inadvertent vaccination of a pregnant woman should not be a reason in itself to consider interruption of pregnancy. However, the patient and her physician should make the final decision about continuing the pregnancy. In summary, rubella vaccine is not known to cause special problems for pregnant women and their unborn babies. However, doctors usually avoid giving any drugs or vaccines to pregnant women unless there is a specific need. Therefore, to be safe, pregnant women should not be vaccinated with rubella vaccine. Rubella can be a disastrous disease early in pregnancy, leading to miscarriages, stillbirths, or birth defects. The severity and risk of the effects of rubella virus on the unborn baby depend on the time during pregnancy when the rubella infection occurs. Up to 85% of infants infected in the first three months of pregnancy (first trimester) will be found to be affected after birth. Even an inapparent rubella infection in the mother can result in birth defects. While infection in the unborn child may occur throughout pregnancy, defects are rare when infection occurs after the 20th week of pregnancy. The overall risk of defects during the third trimester is probably no greater than that associated with normal pregnancies. Common manifestations of congenital rubella include: deafness, which is the most common of the defects; eye problems including cataracts, and glaucoma; congenital heart disease; mental retardation; and many other defects. Some manifestations of CRS may not be apparent for up to 2-4 years after birth. Infants infected with rubella before birth often shed the virus for as long as 12 months after birth, or, rarely, longer. Infants with congenital rubella syndrome, who were infected with rubella before birth, may be able to infect others for usually about a year and can therefore transmit rubella to those susceptible persons caring for them. After an attack of rubella or vaccination against rubella most mothers are protected against the disease for their whole life. However, reinfection with rubella virus can occur. The overwhelming majority of these reinfections occur without symptoms, but occasionally a rash or joint pain have been observed. Rubella reinfection during pregnancy rarely results in transmission of the virus to the unborn child. Rare cases have been reported in which infants with congenital rubella syndrome were born to mothers who were reinfected during pregnancy.